One of my favorite DIY home decor ideas is to create my own art. 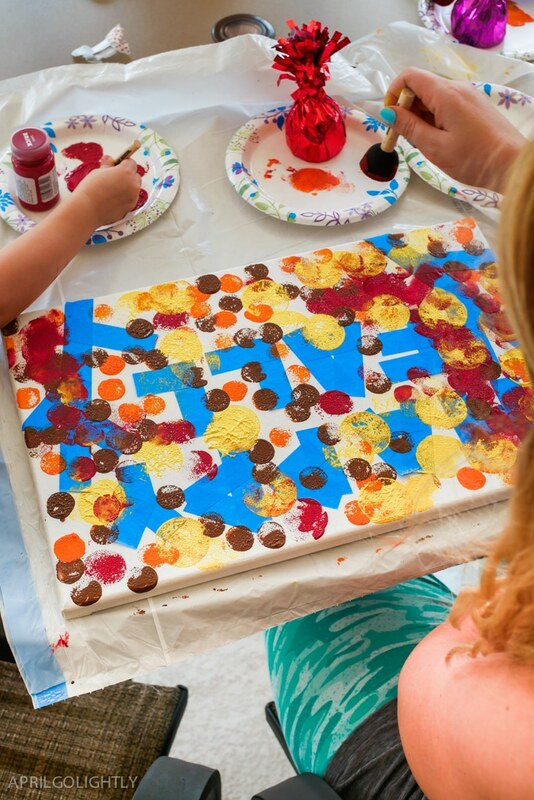 This fall canvas painting is perfect for beginners – even kids and toddlers. This is a craft that is easy enough for everyone to create – even kids! There isn’t any painting or fine motor skills required. All you do is dip the sponge into the different shades of orange. I also love how easy it is to customize. 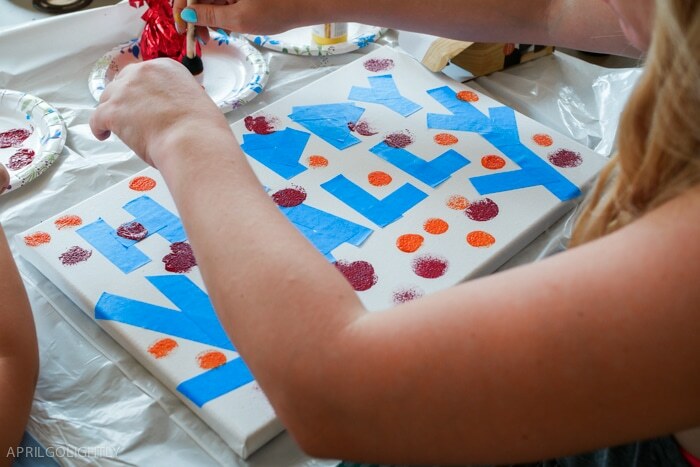 While orange, yellow, and black are favorite fall colors, you can use sprinkles of teal for a fun accent. Or even match the painting to your current room’s decor. Are you looking for some easy fall crafts that you can hang up around the house? Well, this one is perfect! This is so easy, even your toddlers can join in the fun. I’ll give you everything you need to know, including supply list and step by step instructions. You can be really creative with this too! Feel free to make it say other words. I love Happy Fall because it is so simple. Here are some ways to make it more your own. 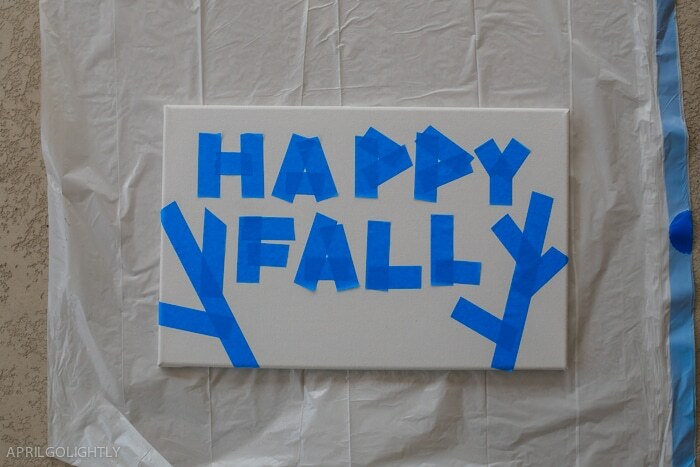 If you make a fall canvas painting, share it with me on Instagram (@AprilGoLightly) so I can see it! Paint the entire canvas yellow and let it dry first. Then put your painter’s tape on top – this will create a much more dramatic look. Before you get started, here are the supplies you’ll need to make your own art. Ready to get started? Here are the step-by-step instructions. Making your own fall canvas painting is going to be a cinch. Our says “Happy Fall” but you can have it say anything you want. First, line the workspace with Garbage Bags or Butcher’s Paper. You need to keep your space clean. Start with a blank canvas and a palette of fall colors: yellow, brown, red, and orange. Tape off words using the painters tape and scissors to create straight pieces. You can do things like ‘Happy Fall’, ‘Happy Fall Y’all’ or ‘Happy Halloween’. Use the round foam brushes to make round dabs in different colors all over the canvas. We used different sizes of foam paintbrushes to create an oversized pointillist painting. Make sure to outline the letters in full so that when you pull of the tape, you can make out the letters. Let the painting dry completely and pull off the tape. This is such a fun and versatile craft! Here is a Julian showing off his art. You can just see how extremely proud he is of his art! The entire process isn’t very messy – which is another bonus. What are some ways to use this DIY canvas art idea? Here are my favorites. Either make it part of a birthday party or even just have friends over just for fun. 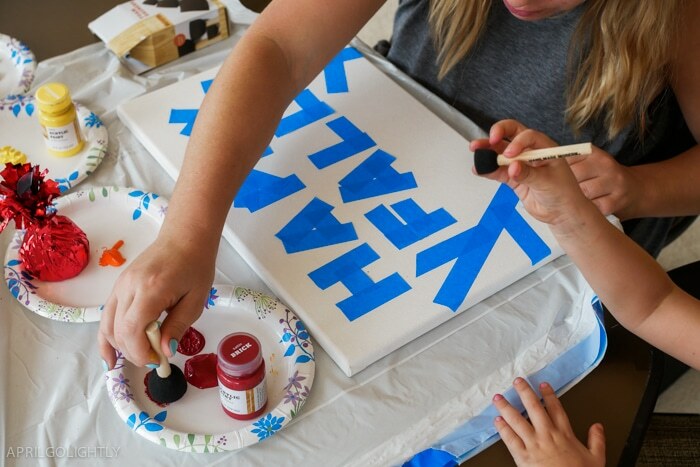 Everyone can make their own canvas art and have something fun to take home and display. If you know someone that just LOVES fall, this is a perfect gift! You can also use their favorite colors or the colors they are using in their room. It also makes a wonderful baby shower gift if you know the color scheme of the nursery. Do you know someone that is moving to a new place this fall? Give them something new to hang on their wall. They will think of you every time they see it. If you are making this with a toddler, take the chance to teach colors. You can also teach shapes by using differently shaped sponges. Plus, holding onto the sponge brushes teaches hand-eye coordination and motor skills. There you go! Don’t forget to pin this idea for later so you have it for years to come. Looking for more crafts? Here are some of my favorites.